This recap contains some spoilers, but we’re purposely avoiding BIG ones and being vague about other ones! To properly appreciate the event, we strongly recommend reading it for yourself. Trust us, it’s worth it. The Marvel Universe is constantly changing. From villains taking over to heroes battling each other over ideological differences, several big events have made drastic changes to the status quo in the primary Marvel Universe, which is called the 616 universe. 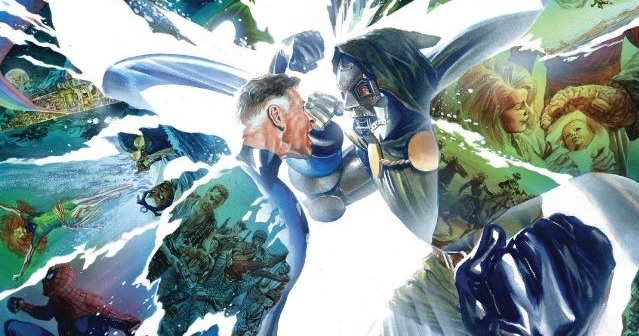 However, nothing has impacted Marvel’s heroes and villains quite like the latest big event: Secret Wars by writer Jonathan Hickman and artist Esad Ribic. Marvel’s world is always in danger. How could it not be with so many ridiculously formidable evildoers running around? But this time, the heroes weren’t able to save the day at the very last second. No, this time around, every single reality was destroyed. As heroes and villains suffered abrupt deaths, one man was able to create a brand new future – and a brand new world to go with it. It wasn’t the heroic Captain America. It wasn’t the brilliant Mr. Fantastic. It wasn’t inventive Iron Man. It was a villain – one of the most dangerous men to ever exist in the Marvel Universe, in fact! Victor Von Doom, a.k.a. Doctor Doom, is the one who made sure the Marvel Universe would continue… but in a completely new way. When the 616 Earth violently crashed into the Ultimate Universe’s Earth, Doctor Doom – with Doctor Strange by his side – was able to capture the Godlike powers that the Beyonders possess. With these immensely powerful abilities, Doctor Doom was able to take pieces from several versions of Earth and cram them together to form a new Earth: Battleworld. On this world, Doctor Doom is God – he did create the planet, after all! Only he and Doctor Strange – along with another person who we won’t name, because spoilers – remember what happened before Battleworld. 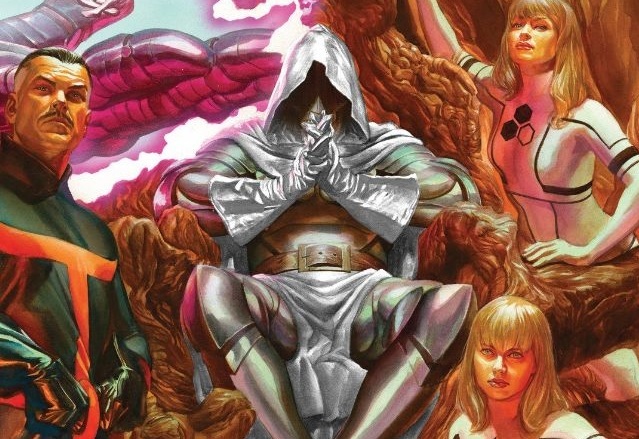 Everyone else on this new planet – which is broken into dozens of Kingdoms, each consisting of familiar faces from different realities – kneels before the absurdly powerful Doctor Doom. 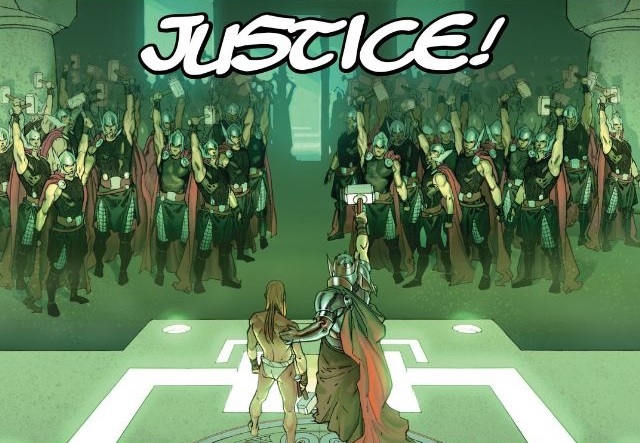 If they step out of line, Doctor Doom has an army of Thors – yes, Thors – to dish out justice. While some people want to defy Doom, the ruler and his army of Thors are able to keep things under control… until something from the old world is found. You didn’t think geniuses in the Marvel Universe would simply accept the end of the world, did you? Of course not! While searching Battleworld, a ship is discovered. Upon opening it, a Thor is brutally and swiftly murdered by the people lurking within the vessel. Soon, it is revealed that Thanos and the Cabal – which consists of Black Swan, Terrax, Namor, Proxima Midnight, Maximus, Coryus Glaive, and The Maker, a.k.a. Ultimate Reed Richards – were in the mysterious object. 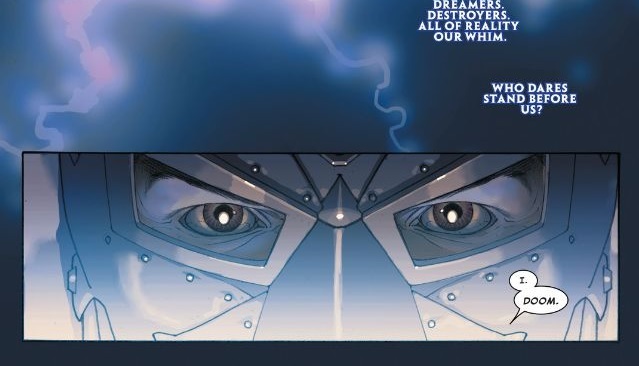 Naturally, these evildoers remember what occurred before Battleworld was created, and you can bet they won’t simply sit back and let Doctor Doom exist as their God. But those foes were unaware of that fact that Miles Morales, a.k.a. Ultimate Spider-Man, was also hiding in there! Elsewhere, another ship is opened, and it holds even more characters from the old world: Captain Marvel, Reed Richards, Cyclops, Spider-Man, Star-Lord, Black Panther, and Thor. As Doom’s forces search for these heroes and villains – people who pose a major threat to all that Doom has constructed – they soon realize it’s not a battle they can easily win. Realizing the outcome of the battle is uncertain, Doom decides to take matters into his own hands. Helpless against Doom’s might, one man makes the ultimate sacrifice to save the heroes – and villains – from Victor’s stunning powers. As these heroes and villains slip through Doom’s cold and powerful grip, they begin to organize and find a way to defeat the planet’s ruler. But what happens to Battleworld if the God is killed? It’s a topic that’s heavily debated between Reed Richards and his Ultimate – and not to mention far more callous – counter-part. Without spoiling anything, let’s just say the assault against Doctor Doom is epic. As more sides begin to enter the fray, the battle becomes more and more hectic. Lives are lost, titans slug it out, and Mister Sinister – who’s been deceptive and annoying Doom the whole time – has quite an amusing role. But not every single hero has joined the chaotic brawl and there’s more than a few creative surprises along the way. Two people – who happen to have quite a heated history – work together to bring a ginormous game changer to the battle. If you’re going to take down someone with the powers of a God, you certainly need something jaw-dropping! This duo not only brings a whole new army to the fight, but they also bring an awesome weapon. Let’s just say it’s an item that’ll make many Marvel fans smile, especially when they see who’s using it. Our recap was pretty vague and that’s obviously intentional! 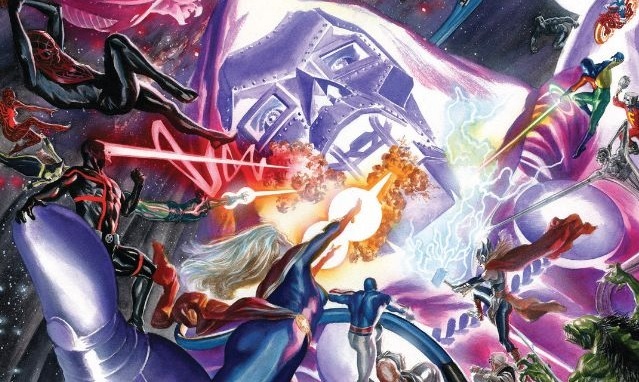 Secret Wars really has been a superb event, and it’s one that we truly believe you should read for yourself. Hopefully this recap has encouraged you to read – or possibly reread – Secret Wars #1-8 so you can witness how everything unfolds before the big finale goes on sale. The combination of Hickman’s writing – which balances huge spectacle, character, humor, and an enormous narrative quite well – and Ribic’s grand artwork makes this an unforgettable big event. Yes, several Marvel titles currently take place after Secret Wars has concluded, but what really happened? What will happen to Doom? There’s so many questions left to ask, and it’s looking like Secret Wars #9 – which releases next Wednesday (1/13/16) – will have the answers. If the issue is even half as good as the first eight chapters, you can bet this is going to be one thrilling conclusion.